During spring and summer, throwing together a fruit salad is so easy. Dump in some delicious fresh berries, mix, done! I just love berries, so it I only have eyes for them when they are ripe and delicious. But we are heading into the season where a couple of things happen. 1. Berries get super expensive. 2. They taste like crap anyway. So we have to scramble and do something different. We went to a family get together recently and I was asked to bring fruit. So I put together some of my favorites for this time of year. The only problem is I didn't want the apples and bananas to turn brown between the time I cut them and serving time. I knew a little lemon juice would help a lot, but I didn't want it to be too sour so I added a bit of honey too. It is simple, but really delicious, healthy and fresh. It is a perfect fruity side for the fall and winter season... then back to berries! Quickly stir together the honey and lemon juice. 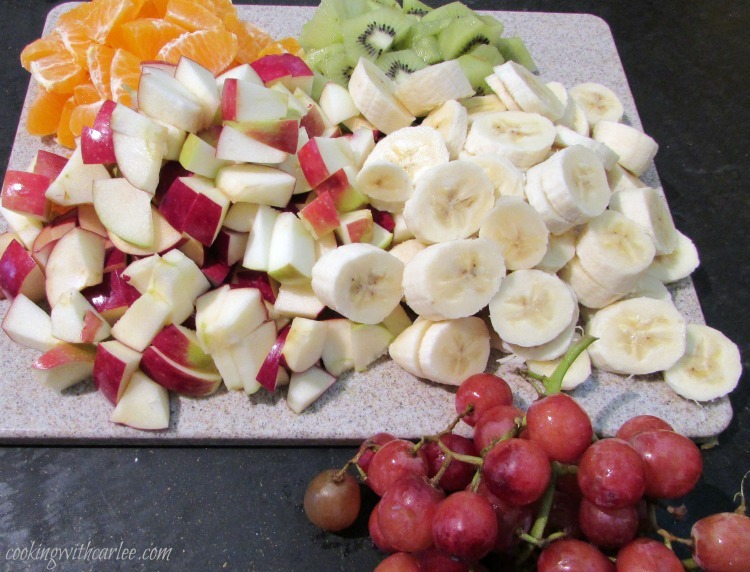 Chop all fruit into bite sized pieces and toss in dressing. That is my kind of treaT. I love the idea of putting just a little honey in with the lemon juice. Mom approved. It's a great way to keep it looking good for longer. The leftover apples even looked ok still the next day... the bananas were a bit mushy but it still tasted good! I always get spoiled with all of the great fruit during the spring and summer, so it is a letdown when it's over. But you are right, pumpkins and apples make it better! Thanks, Jessica! This reminds me if the way my dear, late, great grandma made her fruit salad. And she always served it in a beautiful dish too!! Such a great addition to any meal, we always had it at her house on Sunday's. Aw! This fruit bowl is my grandma's. I know she told me where it came from when she gave it to me. I can't remember if it was passed down to her or maybe a wedding gift or something. I haven't had it long and I couldn't wait to get some fruit in it! Thanks for reminding me that fruit salad should still be enjoyed even after berry season has passed! It's hard to believe, but it is possible! ;-) Thanks, Michelle! Delicious Carlee! I do struggle with fresh fruit idea's in the "off season", so I will be trying this! 0. Thank you! There really are a lot of delicious fruit options still this time of year. For some reason it just seems trickier putting them together! I agree. I don't know why they keep selling some of those fruits. A hundred years ago you could only buy strawberries, blue berries, etc. in season and they tasted wonderful! Your salad looks delicious and the glass dish is spectacular! Thanks for sharing! Thank you! My grandma recently passed the dish on to me and I couldn't wait to get some fruit in it! My brother's birthday is in January and he used to always ask for strawberry shortcake. My mom obliged but paid five or six dollars a pound for berries that weren't even sweet. There is definitely a season for some things! 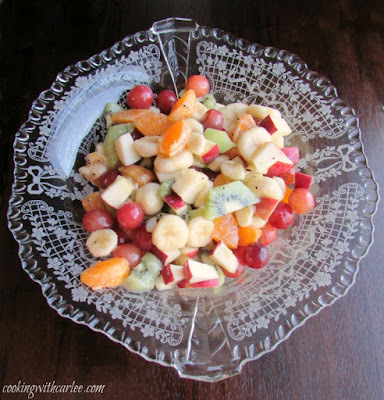 Hello Carlee, This looks like the perfect fall fruit salad and I like that it's so easy to make. Thanks, Julie! While I do enjoy some of the fruity picnic salads that have a lot of extras mixed in, sometimes you just want to taste the fruit! So I wanted to add just enough to keep the browning down but still have the fruit shine through. Isn't it strange how something so simple can be so hard! I used to be the same way. But a bit of honey and lemon juice really does the trick without masking the flavor of the fruit. Thanks! I love this salad and could eat it the year round! Thanks so much for sharing with us today at Full Plate Thursday and have a great weekend! You definitely could have it year round, I just fall in love with berries during the spring and summer and forget all other fruit even exist (other than local peaches when they're in season of course!) Thank you! 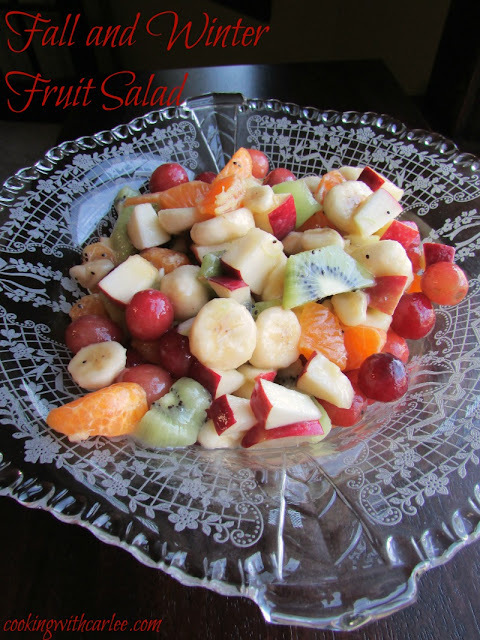 Fruit salad is always a favorite around our house; changing it up for fall and winter is a great idea. Thanks for linking up with Merry Monday last week! It is such a simple side, but for some reason is one of those things I can overthink. This is a great way to get it ready for the new season! I see bananas in the salad but I don't see them in the ingredients list.